Hubble Eyes Stratosphere Around a Very Hot, Watery Jupiter! Extra-solar planet discoveries have been exploding in recent years. In fact, as of Aug. 1st, 2017, astronomers have identified 3,639 exoplanets in 2,729 planetary systems and 612 multiple planetary systems. And while the majority of these have been discovered by Kepler – which has detected a total of 5,017 candidates and confirmed the existence of 2,494 exoplanets since 2009 – other instruments have played an important role in these discoveries as well. This includes the Hubble Space Telescope, which in recent years has been dedicated to the detection of atmospheres around distant planets. Most recently, it was used in a survey that produced the strongest evidence to date for the existence of a stratosphere – a layer of atmosphere in which temperature increases with altitude – around a gas giant located about 900 light-years from our Solar System. The study, titled “An ultrahot gas-giant exoplanet with a stratosphere“, recently appeared in the journal Nature. Led by Thomas Evans, a Research Fellow from the Astrophysics Group at the University of Exeter, the team relied on data provided by NASA’s Hubble Space Telescope to study a planet known as WASP-121b, a gas giant that orbits a yellow-white star that is slightly larger than our own. The planet itself has roughly 1.2 times the mass of Jupiter, has a radius that is about 1.9 times that of Jupiter, and has an orbital period of just 1.3 days. 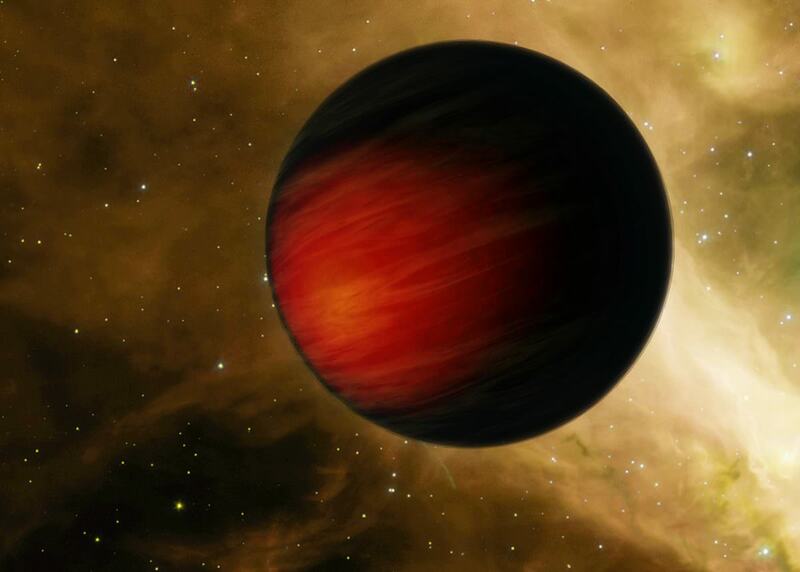 This is due to its close proximity to its sun, which makes it a particularly “Hot Jupiter”. In fact, if this exoplanet were any closer to its star, it is estimated that WASP-121’s gravity would begin to tear it apart. Whereas Hubble has found possible signs of stratospheres around WASP-33b and other hot Jupiters in the past, this new study presents the strongest evidence to date for the existence of an exoplanet stratosphere. The reason for this has to do with the spectrographic data obtained by Hubble of WASP-121b’s atmosphere, which indicated the presence of water vapor – which is a first as far as hot-Jupiter’s are concerned. To study WASP-121b’s stratosphere, the team relied on spectroscopic data gathered by Hubble’s Wide Field Camera 3. After analyzing the different wavelengths that were part of WASP-121b’s light cure, they noted that certain wavelengths were glowing rather brightly in the infrared band. This, they concluded, was due to the presence of water vapor at the top of the planet’s atmosphere. Beyond being the most convincing case so far of an exoplanet having a stratosphere, WASP-121b is also interesting because of just how hot this hot Jupiter is. Based on their data, the team concluded that temperatures in the atmosphere increased with altitude – a defining characteristic of a stratosphere. In Earth’s stratosphere, this process is driven by ozone, which traps the Sun’s ultraviolet light and raises the temperature of the surrounding molecules. However, the temperature of Earth’s stratosphere does not exceed 270 K (-3°C; 26.6°F). When one considers other Solar Planets that also have stratosphere’s – like Saturn’s moon Titan, which experiences heating due to the interaction of solar radiation, energetic particles and methane – temperatures don’t change by more than 56 °C (100 °F). But in the case of WASP-121b, temperatures in the stratosphere increase by about 560 °C (1,000 °F). Not even Venus, the hottest planet in the Solar System, can compete with that! On Earth’s “Sister Planet”, temperatures remain steady at about 735 K (462 °C; 863 °F), which is hot enough to melt lead. But on WASP-121b, temperatures reach over four times as high! This means the planet’s atmosphere is hot enough to melt stainless steel and other metals – like beryllium, platinum and zirconium. At present, scientists do not now what chemicals are driving this temperature increase. Some possibilities have been suggested though, such as vanadium oxide and titanium oxide. Not only are these compounds believed to be common to brown dwarfs (aka. “failed stars”, which have much in common with gas giants), they also require the hottest temperatures possible in order to keep them in a gaseous state. In any case, this distant gas giant has proven to be an interesting case study. In the future, research into this and other “super-hot Jupiters” is likely to challenge and expand our current understanding of how atmospheric forms and behave over time.